EUCLIDEAN is a Black/Post-Black/Progressive Metal band based out of Switzerland. They formed in 2010, and released a self-titled Demo in 2012. 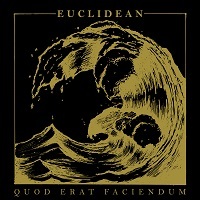 In late 2017, the released their debut full-length here titled “Quod Erat Faciendum,” which translates to English as “that which is to be done.” The album contains eight tracks. “Increatus” leads us off, with low guitar notes that echo in cavernous halls. It slowly begins to pick up in presence and pacing. A repeated pattern of open notes with a little lead melody above it. Spoken words enter the fray. It segues into “Numbers Hold Sovereignty,” a behemoth twelve-minute track. It enters pretty large, with doleful sounds. The vocals are harsh and scary screams, while the main riff maintains a muddy greyness of Doom Metal. “Superstitio” opens with some dissonant guitar work, before it settles into a mid-temp sound. The sounds that they are able to extract from the guitar work are fascinating. It’s frightening and cold…sterile. It ends on a riff so heavy and weighted that it threatens to crush everything underneath it. “As He Reached the Divine Yearning” is a fourteen minute beast. The vocals rage above a lumbering riff of Blackened Doom Metal. It shifts here and there, providing a slight reprieve from the heaviness of the song. Some spoken words appear as almost whispers, too muddy to disclose. A long fade-out closes the song. “Obstinatio” opens with an eerie fuzzy guitar riff that follows that one note lower and back pattern that often accompanies Black Metal. The vocal screams are torrid laments that seem to come from the soul itself, while the music remains sad and depressing. “And God Bred Chaos” opens with a beefy riff and some light percussion, leading to an all-out assault on the senses. The vocals rage while the guitars build a heavy mid-section of maddening depression. “Religio” opens with lead guitar notes that act as bells, taunting the listener with just a bit of melody. The lead guitar notes are stalwart, feeling like they might suddenly spring out of their cover but they remain veiled. Not often have I heard a song say so much with so little. It segues into the fifteen minute mastodon titled “Numbers Held Sovereignty.” It moves slowly and deliberately, while the vocals rage in the forefront. Some extended instrumental passages peak here and there, but the sound remains the same throughout. It rides to completion, as you feel the edges of your sanity fading away. What the album lacks in diversity, it makes up for in confidence. I still haven’t been able to decide the exact genre that I am listening to here. It’s an amalgam of Black Metal and Doom Metal, done in a way that I haven’t really heard before. It’s strong and fierce, and always that level of despondence is ever-present. But they perform it with absolute conviction, never wavering even for a moment. It is a deeply profound album in that sense.